The recent news about the impacts of climate change on the snow sports industry is frankly not news to those in the cross country ski world. While a small segment of the $12.2 billion snow sports business, the cross country ski world has been vulnerable to the vagaries of Mother Nature since its inception (commercial cross country ski areas in the US began in the late sixties, but cross country skiing dates back to drawings on cave walls in 4,000 BC and perhaps earlier in Altai, China). The report called Climate Impacts on the Winter Tourism Economy in the United States, was commissioned by Protect Our Winters (POW) and the Natural Resources Defense Council (NRDC) with scientists at the University of New Hampshire (UNH). The study results tie specific climate data to hard numbers relating to projected business losses for the snow sports industry and the U.S. economy as a whole. In early February, Porter Fox wrote a piece for the New York Times incorporating studies about the decline of the number of annual ski days and the ski industry’s light support of advocacy efforts. He outlines a list of 13 national legislators from CA, OR, UT and WA that have voted against proposed environmental climate legislation and half of them voted against all of those bills. Professional skiers and snowboarders went with POW to Washington last year to lobby Congress to act on legislation to curb climate change and they painted a "clear picture" of how warmer weather is impacting winter sports. Senators from both sides thanked POW and the athletes for their view but they said they needed to know about the economic impact in their states before they could think about climate legislation. So POW joined forces with the Natural Resources Defense Council to place a value on winter and the data shows that winter tourism is a $12.2 billion industry in 38 states. For the 2009-10 winter season New York state alone had a winter tourism industry that supported more than 14,000 jobs and generated $887 million in annual consumer spending. Winters with snow or lack of it at the right times across the country can vastly impact statistics. Jeremy Jones, founder of the POW organization attended and was recognized as a "Champion of Change" at a White House ceremony on April 11, 2013. A letter signed by 75 of the top snow sports athletes including Olympic Gold Medal Champion Cross Country Ski Sprinter Kikkan Randall, was handed to President Obama at the ceremony. The letter referencee the data in the report and asked the President to take action on climate, on behalf of all of us who love and work in snow sports. It was a powerful statement from the snow sports community, delivered by our sports icons, but alas things in the White House have changed. The report based on University of New Hampshire research claimed that the alpine ski industry draws $1 billion less revenue during a poor snow season than it does during a good one and such a business downturn translates to a loss of between 13,000 to 27,000 jobs. Of course, the alpine ski business deploys machine-made snow, so only cold temperatures are needed to cover the slopes with snow. But the rise in temperatures can impact snowmaking opportunities thus cutting the depth of the snow and the length of the ski season. With cross country ski areas, the lack of snow (particularly if it rains when it's not cold enough) can kill prime segments of the ski season such as the holiday period or key weekends. Currently, there are fewer than 40 commercial cross country ski resorts in North America that use snowmaking machines to cover trails; see article at Snowmaking at XC Ski Resorts Becomes Imperative. NSAA, the ski area association in the USA stated that it adopted its Climate Change policy in 2002 that includes a three- pronged strategy in fighting climate change: reduce, educate, and advocate. Moreover, ski areas have been weighing in on energy and climate legislation in Washington for more than a decade. NSAA also launched a “Climate Challenge” program two years ago, through which participating resorts inventory their green house gas emissions, set targets for reduction, reduce their carbon footprint and take other measures. At this point, while the alpine ski industry can "weather" the challenge with snowmaking, the cross country ski industry and snowmobile industry are more susceptible to climate change, and they need some action to begin turning things around. NSAA has joined with the Outdoor Industries Association, Snowsports Industries Association and other regional ski area groups to form the Outdoor Business Climate Partnership. This new group is focused on bipartisan solutions advocacy and helping organization members to reduce their carbon emissions. OIA states that there are 150 million Americans that participate in outdoor activities and the outdoor business contributes about $887 billion to the economy. The OBCP alliance wants to mobilize their member companies to increase action on climate change by supporting the passage of bipartisan climate change legislation in Congress and adoption of market-based policies to reduce Green House gases at the state and utility level. OIA already has tool sets and programs to help member companies reduce their respective environmental impacts associated with the products that they sell. Farm to Feet™ is committed to the single, simple goal of creating the world’s best wool socks for hiking, skiing and sports while having as little impact on the environment as possible. One part of the brand’s recipe for sustainability uses all-American materials, manufacturing, and workers. With its supply chain completely within the US, Farm to Feet is able to ensure the highest quality materials and end products. 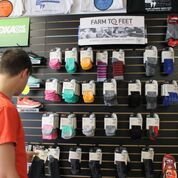 Farm to Feet was launched in 2013 by Nester Hosiery, a leading U.S. manufacturer of performance merino wool socks. Nester Hosiery has been highly involved with the development of the Higg Index and the first sock manufacturer to submit a facility self-assessment to the Sustainable Apparel Coalition’s Higg Index in 2012. The Higg Index tool has allowed Nester to both assess and to obtain insights on areas for improvement in operational sustainability. For example, these insights have helped them reduce their solid waste by 35% over the past four years. Not only are the materials for Farm to Feet socks sourced entirely from its U.S. supply chain, but they go one step further and source all of their packaging and point-of-sale displays domestically – making Farm to Feet 100% American. Nester Hosiery employs nearly 200 people in its Mount Airy, NC facility where it operates state-of-the-art knitting, finishing, and packaging equipment to make socks for the world’s toughest critics. The Farm to Feet socks are made using US-grown merino wool, and American-made nylon and spandex. Merino wool is a durable fiber that keeps the user warm and breaths well to keep the user dry. 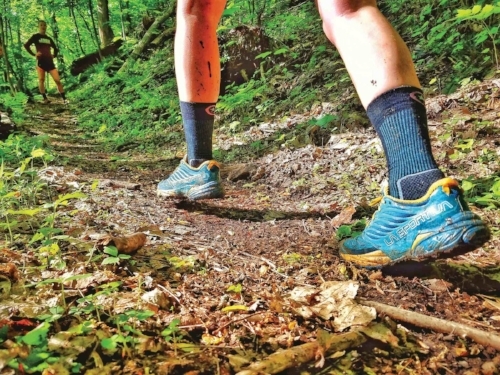 Nylon and Spandex are critical components of a great pair of performance socks. Nylon is important for providing structure, durability, and reinforcing high impact areas like the heel and toe. Spandex is essential for providing stretch and ensuring the perfect fit from the welt through the toe. Once the wool is delivered from western states to the East coast all manufacturing, finishing, and packaging takes place within about 300 miles. Along with a small transportation footprint the socks are knit in a mill that is driven by sustainability. Nester has also recently become the first US sock manufacturer to join the bluesign system. As a bluesign system facility, Nester Hosiery has the ability to produce bluesign certified products, whereby all steps in the process needs to be done in bluesign certified facilities with bluesign certified materials. The bluesign certification process took more than a year where the company proved its ability to implement bluesign's stringent criteria for environment protection, occupational health and safety as well as for consumer safety. Over the past five years, Nester has reduced its water and energy usage through the implementation of steam tumblers (reduced washing and drying steps, time, water, and energy), dumpster dive initiatives, and a proprietary software built from the bottom up to track materials, processes, manufacturing, and shipping. Farm to Feet uses Forest Stewardship Council (FSC) certified paper for its packaging. The FSC logo is printed on all of the new packaging, which is smaller, allowing cases to be packed more efficiently, which helps reduce transportation emissions, while also using less paper. Some of the new packaging is already in stores, and the company will continue to transition away from the larger old packaging throughout 2018. Furthermore, Farm to Feet requires all packaging suppliers to use vegetable-based inks. A benefit of sourcing textiles from the US is the federal and local regulations that are in place to help protect company employees and the environment. Most industrial manufacturers that are dyeing textiles are required to have their own waste water treatment plants to clean any outputs before it enters a municipality’s system. To help ensure that Farm to Feet are using dyes, softeners and finishes that are safe for workers, the planet and consumers. Suppliers are required to comply with the bluesign system. Farm to Feet’s wool is supplied from American Sheep Industry Association member ranches. The American Sheep Industry Association (ASI), along with its member farmers and ranchers, promote and encourage the training of proper sheep handling and shearing. ASI provides its members with the Sheep Care Guide, an educational document for proper care, handling and management of sheep as an industry standard for sheep care. ASI also sponsors training for sheep shearers and provides educational material on proper shearing techniques. Farm to Feet uses merino wool that is grown by American Sheep Industry ranchers and after shearing, it is processed into clean wool top by Chargeurs Wool in Jamestown, SC. From there, the wool is spun into yarn by spinners such as Kent Wool in Pickens, SC and National Spinning in Burlington, NC. After spinning, the yarn arrives at Nester’s sustainability-focused manufacturing facility in Mt. Airy, NC and knit into socks. It doesn’t get much better than that to go from the Farm to Feet™. The Farm to Feet brand understands that in order to fully appreciate the world’s best American-made socks one must have outdoor places to use them in. As a proud member of the Conservation Alliance, Farm to Feet supports and funds the organizations to protect wild places for their habitat and recreation values and it also works closely with other organizations in support of efforts to ensure that future generations can enjoy the outdoors. All Farm to Feet products are guaranteed for life and if customers are not completely satisfied with the durability or performance of their Farm to Feet socks, they can return them and request either a replacement pair or a refund with proof of purchase from an authorized retailer. All returned socks are recycled, which fits well with the other sustainable practices at the company. 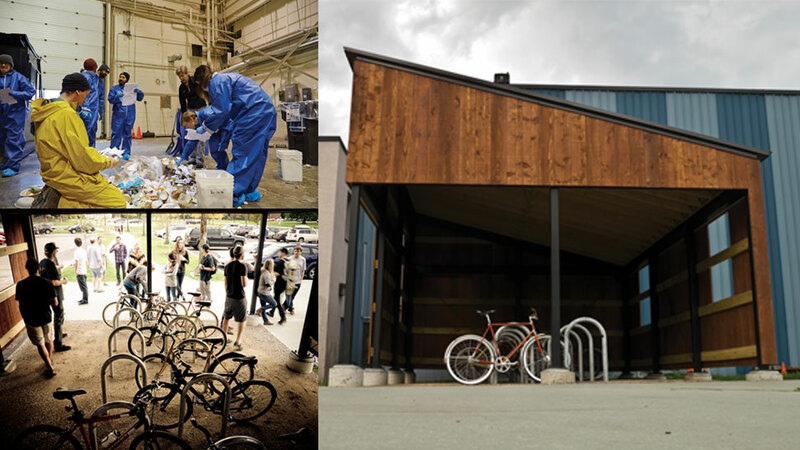 The Craftsbury Outdoor Center in Vermont has one of the most sustainable facilities for it's touring Center, as well as a café, fitness room, waxing room, meeting space and more. This structure was built to be energy-efficient and environmentally friendly, using energy-saving designs and local materials wherever possible. The Craftsbury facility has 3,000 square feet of photovoltaic solar panels on the roof, which will be set up for net metering (selling electric power to the energy company when possible), so that the facility will have net-zero annual electricity usage. There are also 8 tracking solar arrays and the panels produce 39,000-50,000 KWh annually offsetting about 35% of the Outdoor Center electricity. The building structure incorporated locally-sourced wood for paneling and recycled steel beams for support. The interior siding is source from New Hampshire and the furniture legs were from the Craftsbury Outdoor Center site. The locker rooms feature composting toilets, as well as low-flow water fixtures, timed showers, and hand-dryers to minimize paper towel waste. The heating system incorporates waste heat from the snowmaking system along with a high-efficiency wood boiler, supplemented with solar thermal and an air-to-water heat pump as needed. An electric charging station will be installed near the building in the future for electric vehicles. The Green Racing Project ski athletes joined forces with the Highfields Center for Composting to design and build a system with bins for the composting process. The kitchen works with local food as much as possible with 40-50% of the ingredients coming from neighbors in Vermont. The on-site gardens and farm animals raised during the summer contribute to this effort. The net-zero Activity Center showcases features including 3,000 square feet of solar panels on the roof, while the window sizes and roof overhangs are optimized for the weather. The facility has Trombe walls and an EarthTube air exchange unit works with the thermal mass of concrete floors and insulated concrete walls to keep the facility comfortable in both winter and summer. The long term forest management plan combines protection for the water and soil, wildlife habitat maintenance, recreational use, production of commercial forest products such as saw timber and firewood. The Craftsbury Outdoor Center mission includes the use and teaching of sustainable practices and back in 2004, Craftsbury Outdoor Center joined the Green Hotels program and its Cedar Lodge was designated as green by the organization. The business is exemplary for others in the cross country ski world. In 1960, Americans discarded about 1.8 million tons of textiles (2,000 pounds in a ton) and by 2008 that number increased to 12.4 million tons. The most recent information suggests that the average American annually throws away 81 pounds of clothing, which adds up to about 26 billion pounds! The manufacture of consumer goods, including apparel, footwear, and textiles, has traditionally been a pollution-intensive endeavor. In 2008, an effort to measure environmental impact of products from "cradle to grave" or more explicitly, from raw material to garbage dump was undertaken by a group of companies in the apparel business. The Sustainable Apparel Coalition (SAC) was created in 2011, which currently includes about 200 companies and it has developed software known as the Higg Index to provide comparative perspectives of brands with relation to environmental and human rights issues. Another way of looking at it is as a sustainability barometer for operations or a litmus test for product greenness. Most consumers are not aware of factors involved with the apparel business such as the toxic chemicals used for leather tanning, crude oil used in the manufacture of synthetic fabrics, incredibly low wages and no benefits for foreign workers, and excessive shipping distances for manufacturing various aspects of apparel. The Higg Index was created as an indicator-based tool that enables companies to evaluate material types, products, facilities, and processes based on a range of environmental and product design choices. The Higg Index is a suite of tools that enables brands, retailers, and facilities of all sizes — at every stage in their sustainability journey — to accurately measure and score a company or product’s sustainability performance. The Higg Index delivers a holistic overview that empowers businesses to make meaningful improvements that protect the well-being of factory workers, local communities, and the environment. Full Higg Index transparency will ensure accountability by communicating clear, comparable, and meaningful sustainability scores publicly. Using one common language to share sustainability efforts will allow consumers to make informed purchasing decisions and enable the apparel industry to thrive responsibly. To build consistency, credibility, and comparability of Higg Index scores, the SAC is creating verification programs for each of its tools. A verification program will assess the Materials Sustainability Index, the Higg Facility Environmental Module (Higg FEM) and the Higg Brand & Retail Module. All publicly shared Higg Index scores must first be third-party verified. Materials play a significant role in a product’s lifetime sustainability impact. Selecting which materials to use is one of the first steps in a product’s development. Making informed choices at this early stage can have dramatic benefits, especially when that product is produced at industrial scale. The Higg Materials Sustainability Index (Higg MSI) offers users insight into the sustainability of hundreds of thousands of materials used globally in manufacturing. Applying trusted metrics and methodology, the tool assesses a material’s impacts and scores the results. The Higg MSI is an extensive database devoted to the environmental impacts of materials production which assesses the environmental impacts of a material and computes a sustainability score thus it allows users across the value chain to compare materials in a standardized way. The tool offers users trusted data, so sustainable materials choices are easy to make. The Higg MSI includes 79 base materials, such as cotton, polyester, and silk, which when blended and processed in different ways, create hundreds of thousands of materials used across the industry. Applying trusted metrics, a material’s impacts are assessed with calculations for global warming potential, water scarcity, resource depletion, eutrophication (death of a body of water), and chemistry. Manufacturers use the Higg facility modules to measure the social and environmental performance of their facilities. These modules measure impacts at individual factories, not the parent company as a whole, and annual reviews are verified by SAC-approved, on-site assessors. Benchmarking by facility type allows facility managers to compare their performance against that of their peers. The modules’ questions give manufacturers clear guidance on hotspots for improvement and outline the current best practices in the field. The environmental cost of producing and wearing clothes is high. Making a typical pair of jeans can require nearly 2,000 gallons of water and 400 mega joules of energy. Once purchased, caring for that same pair of jeans throughout its lifespan can cause more than 30 kilograms of carbon dioxide to be emitted. That’s equivalent to running a garden hose for two hours, driving a car 78 miles, or powering a computer for 556 hours. The Higg Facility Environmental Module (Higg FEM) informs brands, retailers, and manufacturers about the environmental performance of their individual facilities, so they can make improvements that reduce negative impacts. This module can be used by manufacturers at any tier of the apparel, footwear, and textile industry supply chain. Brands and retailers play a key role in the long-term success of sustainable practices and communicating the value of sustainability to consumers globally. Consumers are also becoming increasingly interested in supporting brands and retailers that are socially and environmentally sustainable and transparent about these practices. Businesses of all sizes can use the Higg Brand & Retail Module (Higg BRM) to measure the environmental and social impacts of their operations and make meaningful improvements. The Higg BRM also supports these Higg users in sharing sustainability information with key stakeholders, including supply chain partners. This assessment helps brands and retailers around the world establish and maintain strong corporate social responsibility strategies and practices that promote the well-being of workers and the planet. The Higg BRM assesses a product’s lifecycle structure from materials sourcing through its end of use. The Higg Brand & Retail Module allows companies to evaluate their environmental and social/labor performance, benchmark against their peers, and identify opportunities to demonstrate leadership. The beta version of this tool will launch in the second quarter of 2018. Helping companies to become aware of the environmental and social issues and practices related to operations and policies is the first step toward moving toward a more sustainable world of business. Vermont’s Killington is now New England’s largest electric car charging hub with a total of 45 electric vehicle chargers throughout the resort’s properties. As a part of parent company POWDR’s Play Forever sustainability efforts, Killington and Pico added additional electric vehicles chargers throughout Killington Resort and Pico Mountain at the Sykeship Base Area, Snowshed Base Area, Snowshed Upper Parking Lot, K-1 Base Area and Pico Base Area for a total of 45 electric car chargers. Killington and Pico also have eight new solar installations on-site for 2017-18, including fourteen AllEarth Solar Trackers which have been designed, tested and engineered in Vermont. The units use GPS technology to follow the sun throughout the day, allowing them to produce up to 45 percent more energy than a fixed system. The trackers, plus three new rooftop installations on the Pico Base Lodge, Pico Administration Building and Killington Golf Course Maintenance Building are expected to generate approximately 200,000 kWh of clean electricity annually. In addition to the on-mountain solar installations, Killington partnered with Namaste Solar to develop four off-site solar farms within a short drive from the mountain. The four projects will generate more than 3,100,000 kWh of electricity per year, which is more than 10 percent of the resort’s annual usage. The electricity produced from all solar initiatives would power 370 homes annually and conserve 2,471 metric tons of CO2, according to the EPA’s Greenhouse Gas Equivalencies Calculator. The recreation of skiing while a healthy and fun activity is often attacked on the grounds of ski areas being energy hogs, but to the contrary, they have been doing plenty, that in reality make them leaders among businesses for sustainable and renewable energy. The Ski Magazine Golden Eagle Environmental Awards program has recognized many New England ski areas among winners each year and participants in the National Ski Areas Association’s “Climate Challenge Program” include Hunter, NY, Killington, Stratton, Sugarbush, and Pico in Vermont and Jiminy Peak in Massachusetts. This year’s winner of the small ski area category Golden Eagle Award was Berkshire East of MA. In 2011, the ski area added a PowerWind 56, 900 kWh wind turbine and in 2012, formed a construction and power purchase agreement with All Earth Renewables, to build and use the electricity from a 1800 panel, 500 KW solar tracking system. These additions, makes Berkshire East the first (and only) ski area in the world to be 100% powered by onsite renewable energy. They also installed 500 LED lights. According to the ski area website, they are applying for a grant to acquire a battery back-up storage system and a biomass chip burning system to burn wood harvested on site. Bolton Valley in VT has had its 121 foot tall wind turbine since 2009 annually producing 300,000 kwH of power and generating electricity at wind speeds as low as 6 mph. The ski resort uses net metering for a price reduction on electric rates and the energy produced is the equivalent of 45 Vermont households. The system was installed by Northern Power Systems. Ice on the blades does happen and the turbine shuts off automatically when it gets iced, thus making the winter months the least productive for the wind turbine. Killington’s numerous new solar power projects are slated to generate more than 3,300,000 kWh of clean electricity annually for the resort and sister property, Pico Mountain. The eight new solar installations on-site at Killington and Pico will include fourteen AllEarth Solar Trackers which have been designed, tested and engineered in Vermont. The units use GPS technology to follow the sun throughout the day, allowing them to produce up to 45 percent more energy than a fixed system. The trackers, plus three new rooftop installations on the Pico Base Lodge, Pico Administration Building and Killington Golf Course Maintenance Building are expected to annually generate approximately 200,000 kWh of clean electricity. The Cow Power program is a unique form of producing energy whereby about a dozen Vermont farmers use cow manure at their farms in an anerobic digester system to generate electricity to sell to Green Mountain Power and Killington purchases 1,125,000 kWh annually of this energy to power the K-1 Gondola and the Peak Lodge. Jiminy Peak Mountain Resort located in the heart of the Berkshires of Western Massachusetts constructed a 2.3 megawatt community solar facility located on 12 acres of the ski area and resort's property, owned and operated by nexamp. 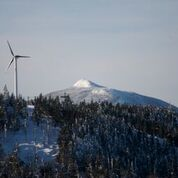 Renewable energy is not new to the resort – back in 2007 it was the first ski area in North America to generate power from its own GE 1.5 MW wind turbine. The solar project significantly expanded Jiminy Peak's renewable energy program, while extending the environmental and cost-saving benefits of solar to up to 200 neighboring homes and small businesses. By adding the solar power facility to Jiminy Peak's existing wind turbine, 75 kWh cogeneration unit, and extensive conservation efforts, the resort can claim to be one of the few resorts in the U.S. powered 100% by renewable energy and one of the most sustainable energy ski resorts. Gore Mountain in North Creek, NY was recently awarded the SKI Magazine Golden Eagle for Overall Environmental Excellence based on the contracting of two 25-year solar power purchase agreements, which combine into a massive 5.325 MW system. Using remote net metering, Gore's will offset 85% of its electrical needs. In cooperation with Borrego Solar, there are 14,589 ground-mounted solar panels located on 20 acres of farmland. The agreement is projected to offset 113,919 tons of carbon dioxide, 71,634 pounds of nitrogen oxide emissions, and 131,835 pounds of sulfur Gore Mountain over the life of the contract. Nordic ski areas are also becoming more sustainable. Craftsbury Outdoor Center in VT has incorporated sustainability in its mission statement to be carbon neutral. At Craftsbury Outdoor Center everything is net metered with 32kW on the trackers and 3,000 square feet of panels on the roof, supplying the Activity Center with close to 70kW. Between the two, that provides 63% of operation’s electricity and there is also solar thermal to provide summertime domestic hot water, which is supplemented with heat pumps. Craftsbury has incorporated massive amounts of insulation into all of the new buildings, and locally sourced many of the wood products used in the building construction. The roof of the Activity Center is at R72 and the walls are R46. High efficiency wood gasifying boilers provides all of the heating and domestic hot water demands during the cooler months. They're tied into the 10 million BTUs of thermal storage in the form of 20,000 gallons of water. This storage system allows them to cogenerate with the snowmaking generator - providing electricity for the pumps and guns, and catching waste heat off the engine. Sleepy Hollow Inn Ski & Bike Center in Huntington, VT added 10 kwH of solar this summer and now has 50 kwH of solar net metering from its solar panel arrays to provide for electric needs that include power for a snowmaking system used to guarantee snow early in the season. A solar hot water system heats 50% of the hot water use at the inn and the lights on the ski trail have been converted to LED lights. Sleepy Hollow Proprietor Eli Enman commented, "By April, we're expecting to see that close to 100% of our total electricity would've been powered by solar energy and that includes our all-electric snowmaking system water and air pumps." 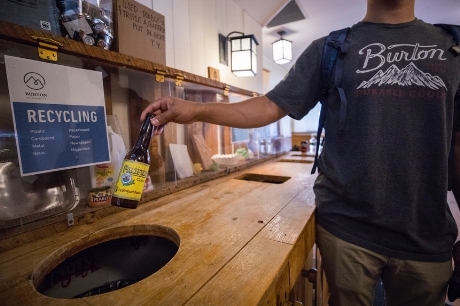 These investments at eastern ski areas are only a few examples of what the resorts are doing to take the lead in becoming sustainable businesses. The solar project significantly expanded Jiminy Peak's renewable energy program. All power generated by the 7,500-module solar facility is exported to the grid. Resort president Tyler Fairbank said, "We receive net metering credits in return. Half the net metering credits are utilized by Jiminy Peak and the balance by about 200 neighboring homes and small businesses in the local area." Jiminy has upgraded to more efficient lighting and programmable thermostats in the lodges, and the resort more than doubled the energy efficiency of the lights used on the slopes for night skiing. In the Country Inn, 658 lights were converted to LEDs to be more efficient and 230 slopeside lights have been replaced with lighter, brighter, more energy efficient LED lighting covering 60 percent of the mountain. The difference has been likened to that between a manila envelope and a white envelope. Waste oil is taken from snowmaking compressors, grooming machines, and all vehicles to heat the Mountain Operations building using approximately 200 gallons of waste oil per year and the process avoids the storage and disposal of old used oil. Jiminy Peak installed a cogeneration unit in the Country Inn. The unit uses propane gas that powers a turbine that in turn produces hot water for use throughout the Inn. This hot water also provides the heating source for the central core of the building that includes the year-round outdoor pool, hot tubs, and John Harvard's Restaurant & Brewery, too. Using the heat from two snowmaking compressors to heat 34,000 square feet of space in 3 Village Center buildings avoids the need of an equivalent of 63,800 kWh. The towel and sheet program in the lodge rooms saves about 25,000 gallons of water a year by only washing the sheets and towels when requested by guests staying for more than one night. They've eliminated the use of toxic cleaning agents and only use green, biodegradable solvents and cleaners. Conversion to waterless urinals in bathrooms of several buildings and at JJ's Lodge saves 40,000 gallons of water per urinal. Zephyr Wind Turbine is a selfie magnet atop Jiminy Peak! Jiminy averages 615 acre feet of snow per winter using machine-made snow and approximately 123,000,000 gallons of water. The entire 450-gun snowmaking arsenal was replaced with energy-efficient Snowgun Technologies “Sledgehammer” snowguns. The new guns convert more water with less air and at warmer temperatures than traditional snowguns. This means the resort runs air compressors for fewer hours, consuming less electricity, while producing 100% more snow (assuming Mother Nature cooperates). For example, the snowmaking system's old technology would have required 4,566,100 kWh ten years ago versus 1,368,326 kWh today. The annual savings is 70% in energy or 3,197,774 kWh. Jiminy Peak has equipped two PistenBully groomers with digital mapping and GPS to tell drivers exactly how much snow is beneath their treads, blades and rollers. The maps are based on aerial photography captured during summer, and are accurate to within two inches (5 cm). “Rather than eyeball it, the SNOWSat technology allows us to more precisely gauge depth and place more snow where the cover is thin, and less where the cover is already sufficient for skiing or riding. This means fewer passes by groomers,” Van Dyke explains, noting that Jiminy Peak is one of only a few resorts in the U.S. using the new technology. Speaking of groomers, Jiminy Peak is purchasing the new energy efficient Pisten Bully 600 E+ snowcat, one of three in use in the northeast. Kassbohrer’s Pisten Bully “Green Machine” 600E+ is the world’s first groomer with a diesel-electric drive. One of the most significant advancements in snowgrooming technology over the past two decades, the 600 E+ uses a diesel engine to drive two electric generators which power electric motors that turn the tracks and the snow tiller. It reduces the emission of nitrogen oxides and carbon dioxides by 20%, produces 99% fewer sooty particles and registers a 20% fuel savings over their standard 600 model. There are plans at Jiminy Peak for the installation of four EV charging stations, working with an Albany, N.Y. EV Drivers Club, with support from Tesla. Van Dyke notes that EV car owners, in addition to saving on fossil fuels, will be recharging with renewable electricity generated by both solar and wind. Jiminy Peak has won environmental recognition, but awards are not why Jiminy Peak Resorts conserves and invests in renewable energy. Fairbank reflected, "Conservation is practiced every day at Jiminy Peak. It's part of our corporate DNA. We have an in-house energy management team that conducts an on-going and aggressive program to help us to identify and curtail energy waste and research ways to source 100 percent of our energy from renewable resources. They are constantly evaluating opportunities for savings. Our renewable efforts have come from facilities we've built and we’re proud for reaching 100% of our electricity energy, which is from local, on site-generated renewable resources." Recently, a gentleman from Quebec drove his 2012 Ford Focus Electric car up the Mt. Washington Auto Road to the summit of the Northeast’s highest peak. This was the first mass produced all electric vehicle to reach the peak taking the winding 8-mile road with an average grade of 12%. This story brought back memories of my first ride in a hybrid Toyota Prius in 2001with a friend, who was a newly elected official in Colorado. One of the perks of his political position was a vehicle to use and my friend felt compelled to request a hybrid car instead of a 4-wheel drive that the other officials had always requested. Over the years, this memory encouraged me to often suggest that all government automobile purchases should be electric vehicles and while the government might put its money where its mouth should be, all public buildings should have roof top solar collectors, too. Can you imagine what this level of purchases would do for these products or how it could lead the way to fight climate change? Instead, even though there were 200,000 of the Toyota Prius sold in 2012, it was announced that General Motors has idled the assembly plant, which manufactures the electric Chevy Volt because they’ve sold less than half of their annual projection (13,500 cars sold and 40,000 projected sales). The electric Nissan Leaf had sold 4,288 in 2012 through August. And the Ford Focus Electric vehicle, the car that made it to the top of Mt. Washington had sold only 169 (in the USA). Think about the number of vehicles if every level of government (town, city, county, state, Federal) was mandated to purchase electric vehicles starting this year; hmmm, that’s a big number. In an August 2013 followup to the above story, the Mt. Washington Auto Road has installed the first ever Electric Vehicle Charging Station. Less than 24 hours later, the all electric vehicle, a Tesla S Model, pulled in for a charge. The Auto Road does not "charge for a charge", though a donation slot is there for those so inclined. Fifteen more Teslas from the New England chapter of the Tesla Car Club arrived for a drive to the summit. Auto Road GM Howie Wemyss decided this was the year to have the Clipper Creek CS 90 charger installed. "Considering that we are hosting the Mt. Washington Auto Road Alt Energy Summit event here on September 14 and 15, there couldn't be a better time to make this kind of energy available onsite," Wemyss noted. "We are looking at adding an electric vehicle to our line-up sometime this year and have been evaluating various alternative fuel sources for our stages, as well," Wemyss added. The Auto Road currently derives about 80% of the energy used for the base building operations from an onsite hydro power source. Daniel Einspanjer, a Tesla S model owner and organizer of the group's gathering commented, "The trip up and down the mountain was as breath-taking as always and everyone enjoyed it. As expected, the trip down was excellent. The cars could not have been built better for descending a mountain. Stable, low to the ground, and aerodynamic, the cars handle wonderfully on the road. Additionally, the regenerative braking means that you don't have to worry about a straining engine or overheating brakes as the car gracefully glides down at a comfortable and safe speed requiring only occasional touches of the brakes at the hairpin turns." Perhaps even more impressive than the view and drive down was the energy consumption data: "The 8 mile long and 4,600 feet high ascent consumes somewhere between 12 and 14 kW of energy (about 40 to 45 miles of rated range), while the descent reclaims between 5 and 7 kW of energy (about 20 to 23 miles of rated range) through regenerative braking. There are currently more than 13,000 Teslas on the road in the US" Einspanjer noted. In early September during President Obama's visit to Alaska, an op-ed piece in the Alaska Dispatch News was written by 4-time Olympian and 3-time World Cup Cross Country Ski Sprint Champion Kikkan Randall. Kikkan grew up in Anchorage and wanted to opine about a topic she feels deeply about - climate change. "Cross-country skiing is my job, my passion and my life. I'm an Alaskan, and like many Alaskans I got my first skis around the same time I learned to walk. To me, snow is family. Skiing, snowshoeing, sledding, and simply playing in the snow are how we form friendships as children, how we bond as families, how we connect as communities." "This summer, hundreds of fires encompassing nearly five million acres burned across Alaska. People in the Lower 48 have a hard time believing this. They think of Eskimos and polar bears when they think of Alaska. Forest fires are for hot and dry places, for Colorado and Idaho and New Mexico. Increasingly, they are the norm up here, too. The patterns we knew as children are changing." Randall recalled that as a child, she visited a local glacier remembering how cool it was to watch the glacier calve right there in front of her eyes. Thirty years later, that glacier is no longer visible from the visitor's center. Children visiting today can no longer experience that powerful natural force as she did. In summer, Randall trains on the glacial snowfield above Girdwood, Alaska and has watched that glacier change before her eyes through the years. "Every year there are more crevasses, more runoff, more melting." While racing on the World Cup circuit for nine years she's witnessed the global winter meltdown firsthand. "More than half of International Ski Federation (FIS) competitions are now held on machine-made snow. Even with snowmaking, however, national and international cross-country races are being canceled at an increasing rate because temperatures are not cold enough to make snow. You don't have to be a scientist to understand this. Randall commented that Alaska has warmed twice as fast as the rest of the United States over the past 60 years. "We are on the front lines of change. Speak to the residents of Kotzebue or Kivalina about thawing permafrost, (which is especially problematic as it'll release toxic methane from lake bottoms), or the disappearance of sea ice and storm surges making relocation of all the residents an almost certainty." During his visit, President Obama talked to locals when he traveled to Alaska and became the first sitting president to ever visit the Arctic Circle. He saw the impacts of climate change for himself. Randall hopes that Obama's trip to Alaska pushes him to make climate action a part of his legacy. Obama had already begun to act with the Clean Power Plan announced in early August to begin cleaning up the nation's power plants, which are the source of 40% of American carbon emissions. Alaskan Senator Murkowski lobbied successfully to have Alaska exempted from the plan, with which every other state must comply. Randall feels that Alaska should lead by example, not seek exemptions from climate action. "In Alaska, the replacement costs of public infrastructure from climate change could be as much as $6.1 billion over the next 20 years, and the U.S. Army Corps of Engineers says it will cost $125 million to relocate just one of the many villages impacted by rising sea levels. And the area burned by wildfires in Alaska is projected to double by mid-century and to triple by the end of the century." "The social costs will be even greater. Native American culture, entire villages and ancestral hunting and fishing grounds, could be lost forever." Randall calls on Alaskans to show support for the Clean Power Plan and climate action. Kikkan Randall has spent her life nurturing speed and she urges everyone to act fast to safeguard snow and winter and Alaska. "We must harness our collective power as citizens to make change. It's time to fly, to go fast." Erik Sports, a Nordic and snowshoe equipment supplier for more than three decades decided to increase company sustainability by addressing building power and heating needs in its Tranquility, NJ location. The company is most known for the White Woods brand of Nordic and snowshoe products. Company president, Michael Messler spoke with XCSkiResorts.com about the renovation projects including an upgrade to plant lighting, retrofitting the boiler, and solar panel installation for thermal and photovoltaic purposes. These projects brought both environmental and financial advantages to the company's operation. The lighting upgrade provides improved light and it will result in 65-70% in energy savings, A wood boiler replaced the oil-powered heating system. This system will be integrated with a solar thermal unit so that the wood will be used only as a backup. These undertakings and investments make Erik Sports one of the most sustainable product companies in the business. Swix Sports USA based in Haverhill, MA has a new facility that features high efficiency heating systems, motion-controlled lighting throughout the warehouse, and a self-regulated low flow water system. The solar array on the roof covers the 53,000 square foot warehouse sending about 343,000 kilowatt hours of electricity per year back to the grid. The $1.5 million solar project was thanks to an agreement with Leewood Realty and it displaces more than 600,000 pounds of CO2 and could provide electricity for 34 homes for a year. Fischer Ski Company has had a biomass CHP plant for heat in its Austrian manufacturing facility since 2001. Special water treatment filter systems have achieved a reduction of 40% in the use of industrial water. A Fischer ski production plant in the Ukraine was changed to 100% renewable energy in 2009, but details were not available in the company information about the plant. In the years 2001-2010, Fischer operations have lowered carbon emissions by 84.7%. Madshus, a brand within the K2 Skis company has introduced some cross country ski boots in its line that do not incorporate PVC (poly-vinyl chloride), which is claimed to be harmful to the environment. PVC is a material that is often used in boot soles. More green efforts accomplished by product suppliers will be posted in the Green Room as they become available. This summer Vermont ski resorts are investing nearly $15 million to upgrade their snowmaking equipment, thanks in part to an innovative rebate offer from Efficiency Vermont. Efficiency Vermont's Great Snow Gun Roundup supports the purchase of approximately 2,300 new low energy snow guns for the upcoming season, and in return the resorts will donate 1,800 older model snow guns to scrap. The snow gun exchange program is expected to help the state's ski industry reduce carbon emissions and save $2 million a year in energy costs. Efficiency Vermont said they counted 3,000 -3,300 older technology guns at the beginning of the summer, and about 1,800 -2,000 of those scrapped. The estimated annual energy savings from this swap is equivalent to saving enough electricity to supply approximately 1,500 homes for one full year, and enough diesel saved to heat 340 homes annually. These new guns are not only saving tons of energy for resorts, which will allow them to rely on less power and lower emissions, but they will also create better quality snow surfaces and enable resorts to blow snow at higher temperatures, extending the ski season for winter revelers everywhere. "An industry-wide upgrade in snowmaking efficiency of this magnitude has never been seen before," said Parker Riehle, Vermont Ski Areas Association President. "We are very proud of our partnership with Efficiency Vermont and that our resorts are leading the way in switching to low energy technology. To help ski areas determine the efficient snow guns that would best meet their needs, Efficiency Vermont engineers conducted side-by-side testing of fifteen different models, tracking data on their air, water, energy consumption, and overall performance. Modern, energy efficient snow guns require up to 85% less energy to operate than older snow gun models, and the new snow guns being installed this year represent the most advanced. Efficiency Vermont has also pledged to donate proceeds from the scrapped metal of old snow guns to Ski Vermont's Learn to Turn program, which encourages people to embrace winter and try skiing through Learn to Ski month, the Fifth Grade Passport, and Bring a Friend challenge. Follow the progress of Vermont's Great Snow Gun Roundup via #VTSnowUpgrade. Ski Vermont (Vermont Ski Areas Association) serves its 20 Alpine and 31 Nordic member resorts in three major areas: Governmental Affairs, Marketing and Public Affairs. Efficiency Vermont was created by the Vermont Legislature and the Vermont Public Service Board to help all Vermonters reduce energy costs, strengthen the economy, and protect Vermont's environment. For more information, contact Efficiency Vermont at 888-921-5990 or visit the site. Photo: Snow guns at Rikert Nordic Center in Ripton, VT.
Andy Newell, a US Ski Team Nordic ski racer has competed in three Olympic Games from Torino, Italy to Sochi, Russia experiencing different venues over the years, seasons with high snow pack and others with none, and he's seen change both in climate and in attitude. Newell shared his reflections of the Olympics in Sochi, Russia with the Green Energy Times last spring. Newell questions the extreme measures host nations and our world leaders are willing to go to not only to capitalize on the Olympics but, more important, turn a blind eye to our changing climate. His first trip to Sochi was a year and a half before the Games when he was introduced to the beautiful snow covered peaks in one of Russia's largest national parks. Fast-forward 16 months and several billion dollars later and Newell reported that there were hastily built resort towns, huge unfinished hotels, and thousands of acres of clear-cut forest and polluted waterways. Newell remembered, "Upon arrival at the Olympics we were bussed to one of the six gondolas to access the Nordic and biathlon stadiums. Of course everyone was giddy with nerves and excitement over the upcoming competitions, but as we crept higher up the 8,000-foot peak to where the Endurance Village was located, we could get a true vision of the destruction below." "A bad snow year had left the valley floor brown and muddy, highlighting all the construction debris. Looking across to the mountainside where the alpine and snowboarding events were to take place, we saw massive swaths of hillside clear cut to accommodate the new trails and lift towers of a future alpine resort. All of this was created to capitalize on the Olympics and to create what was envisioned as Russia's next big tourist destination, but at what cost?" The underlying theme is that Newell feels we should expect more from our world leaders and the individuals accountable for these decisions. Why was this untouched land chosen for the Games? Why can't world leaders work together to find methods to take the environment into account? The Sochi situation led Newell to start the organization Athletes for Action to urgently voice the need for change. Before the Games, Newell collected signatures from Olympic competitors urging world leaders to recognize climate change and work together toward solutions. Newell feels that it is his responsibility and he wants to attract other outdoor enthusiasts who witness these changes, to voice concerns and put pressure on leaders. He'd like to raise awareness and, most important, encourage more climate-friendly decisions and legislation from government officials. Andy Newell has been part of the US Ski Team for 10 years and earned a spot on the 2006, 2010 and 2014 US Olympic Teams. He splits his time between southern VT and Park City, UT and has top five finishes at the World Championship and World Cup competitions.